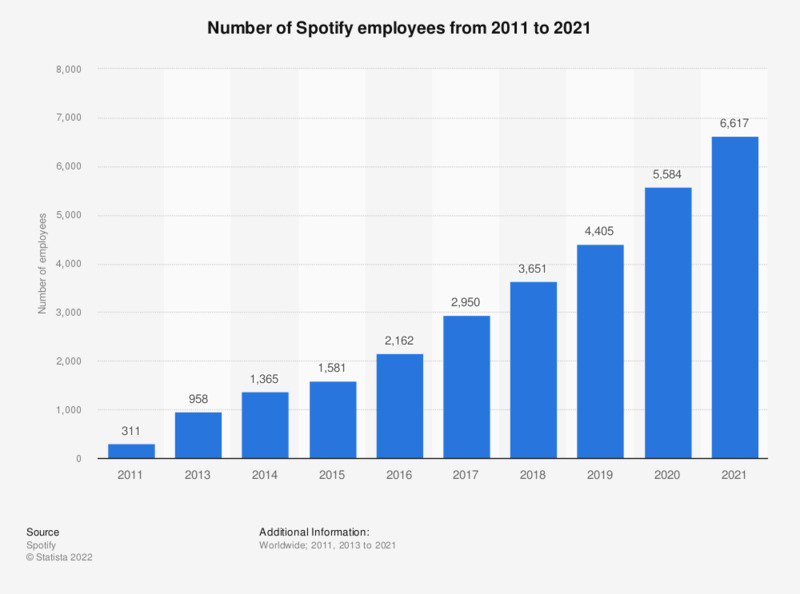 This statistic gives information on the number of Spotify employees from 2011 to 2018. In the most recently reported period, the total number of employees at the music streaming service was 4,165. In 2011, Spotify employed 311 workers. Starting out as a Sweden-based startup, Spotify has evolved into a strong player in the digital content subscription market. The music streaming service was publicly launched in 2008 and has gone on to become a company with more than 5.25 billion euros in annual revenue. Spotify legally provides content from record labels including EMI, Sony, Universal and Warner Music Group. The basic version of the service is free and higher tiers of paid subscription feature no ads and access on mobile devices. Although available as a stand-alone service, Spotify made its US debut in July 2011 as a Facebook application and has since included heavily integrated social features like shared tracks and messaging between users. As of September 2015, more than 39 million users were accessing Spotify via the social network. The streaming service currently has more than 20 million paying subscribers, up from 10 million in May 2014. As of February 2015, Spotify ranks as one of the most popular audio apps downloaded by US smartphone users and one of the most popular streaming media sites in Europe. Streaming media is currently undergoing a strong upwards trend with global digital music revenues amounted to 2.8 billion US dollars in 2017. With the decline of physical music sales, the digital revenue of easily accessible streaming services is more important than ever. No reported figures for missing years, 2011 and 2013 from earlier publication. Do you have the possibility to download movies through gaming console, digital receiver, Blu-ray/DVD player or similar devices?